2-Year warranty and life-time technical support. Any troubles, feel free to contact us. The slideshow clicker is only equipped with 4 compact functional buttons. To page up and down, turn to full or black screen, power on or off, laser on or off are all at the 4 buttons. The laser pointer is qualified with international class 3R infrared laser. It's bright enough to highlight the point no matter in the dark or in the light. With restricted beam viewing, a class 3R laser is considered safe but still it should be handled carefully to avoid any injury. It's not suitable for children to use. 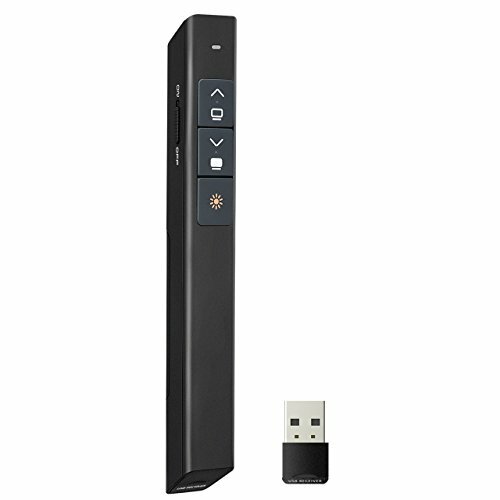 Unlike the ones with independent receiver, this presenter is endowed with a built-in USB receiver. The receiver will be easily stored in the clicker magnetically. It's not easy to lose only if you store it in the bottom of the laser pointer after each use. It helps you always keep easy and calm before or during the speeches. It's customized for teachers, tutors, white-collar employees, and other training staffs. To make the presentation more interesting and attractive, to create more interactions with your audience, this clicker is absolutely necessary. Presenting it to your teachers or any friends who need it will be great. 1.Please DON'T direct the laser light on human or animals, especially the eyes and skin. 2.If the presenter is in idle for long time, please take the battery out to prevent any corrosiveness. Advanced Highlighting & 98 Foot Super Long Wireless Range : Move and present freely from as far as 98 Foot away. Perfect for large-size rooms.Brilliant red laser light up to 100m/328ft that is easy to highlight your main messages and keep your audience engage. Plug And Play : A plug-and-play no need for any drivers, just plug the usb dongle into a usb port on your mac or pc .The buttons are silicone made with convex point design, helping you precisely locate the right button quickly. So you can pay full attention to your presentation and control the screen without even a glance at the pointer. Intelligent Energy-Saving :The presenter will be standby automatically and fall in deep sleep if there is no operation. If the battery power is running out, the indicator light will flash red for 3 times to remind you of changing the battery in time. Note: battery is not included. Anti-lost Magnetic USB Receiver: mini USB receiver stored in wireless transmitter tail which it stays secured into place with a magnet system. It helps you always keep easy and calm before or during the speeches. Universal Compatibility: The presentation clicker is optimised to work with Windows XP/7/8/, Mac Os, Linux, Android. The laser pointer compatibles with Microsoft, Powerpoint, Keynote, Prezi and so on. Especially for teachers, tutors, lecturers and speakers, it helps a lot. If you have any questions about this product by Yantop, contact us by completing and submitting the form below. If you are looking for a specif part number, please include it with your message.